YouTube provides analytics to measure the performance of your YouTube channel. Wouldn’t it be nice if you could get those analytics for your channel right inside WordPress? In this article, we will show you how to add YouTube analytics to your WordPress dashboard. 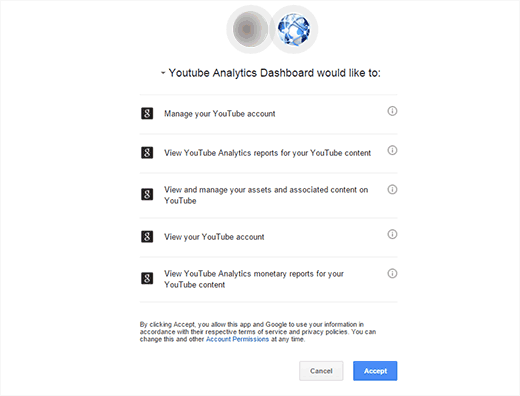 First thing you need to do is install and activate the YouTube Analytics Dashboard plugin. 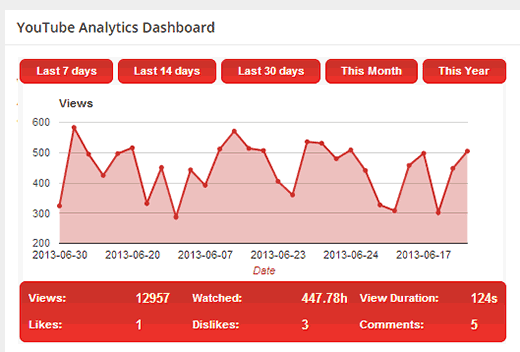 Upon activation, simply go to WordPress Dashboard and scroll down to see a new YouTube Analytics Dashboard widget. You will need to give plugin the permission to access your YouTube account. To do that, you need to click on the Get Access Code link in the widget. It will take you to your Google Account, and you will be asked to give permissions. Simply click on the accept button, and you will see your access code. 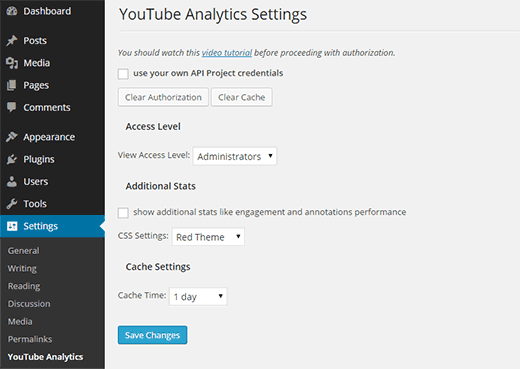 To configure the plugin settings you need to visit Settings » YouTube Analytics. The first option in the plugin settings is to use your own API Project credentials. Below that there are two buttons to clear authorization and to clear cache. Clear authorization will remove the YouTube access code you added earlier and cleaning the cache will remove the data the plugin downloaded earlier. The next option is to choose the user roles allowed to see the YouTube stats. The default option is administrators however you can change that if you need to share your channel’s analytics with other users on your site. For stats like engagement and annotations performance, you need to check the box under additional stats. The plugin also allows you to choose a CSS theme for the stats widget and time duration for the cache. Once you are done customizing, click on the save changes button to store your settings. 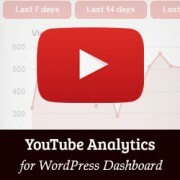 That’s all, we hope this article helped you add YouTube analytics to your WordPress dashboard. You may also want to check out these useful YouTube tips to spice up your WordPress site with videos. This is a good function to have but there is no rhyme or reason to how the graph sorts. It’s not by date or by number of views. I contacted the developer and he tells me a fix is in the works. What I would find VERY useful is a program that would automatically notify FB friends AND an e-mail lists of new posts and pages to my site….Are there are any currently like that? Without adding two or three new plug-ins? Is it possible to achieve this with currently available FREE plug-ins?